Bonita Bay Bonita Springs is a luxury community widely recognized for setting the standard for environmentally responsible development in intimate neighborhoods. 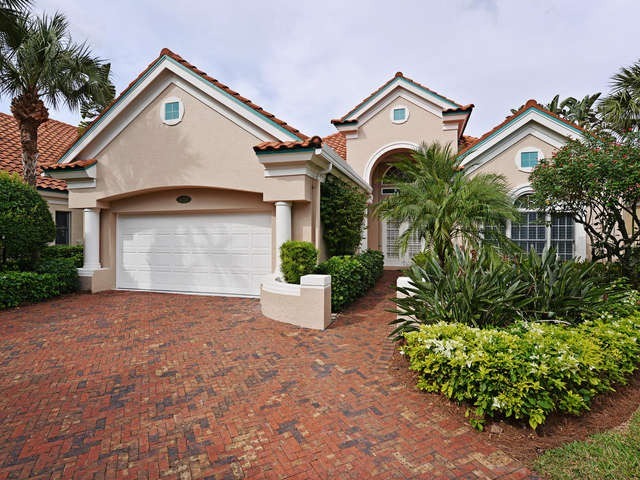 Bonita Bay real estate consists of multiple Bonita Bay neighborhoods, with custom single-family homes, villas, carriage homes and luxury Bonita Bay high-rise condo residences that overlook the Gulf, bay, lakes, golf courses or nature preserves. Bonita Bay real estate features more than 1,400 acres remain open space, including 230 acres of lakes, expansive natural preserve areas and more than 12 miles of bicycle and walking paths. The Bonita Bay community also has four waterfront community parks that are designed to accommodate a variety of resident interests and activities. The Bonita Bay Club is member owned and the community was voted one of the Top 100 Communities in 2006-2007 Travel & Leisure Golf. Bonita Bay boasts 2,400 acres dedicated to maintaining the natural beauty of Southwest Florida. Few communities are as abundant with natural beauty and an intimate relationship with the environment as Bonita Bay. From the moment you drive through the guarded gateway at Bonita Bay, a sense of harmony between man and nature is evident. More than half of the 2,400 acres in Bonita Bay has been dedicated to parks, lakes, nature preserves and open spaces. More than 10 miles have been allotted for bicycling and jogging trails in Bonita Bay. Each of the four waterfront parks - Bonita Bay Beach Park, Estero Bay Park, Spring Creek Park & Riverwalk Park - offer something unique. Bonita Bay Florida home owners are eligible for membership in the Bonita Bay Country Club, which, in addition to 90 holes of championship golf, offers an 18-court tennis and swim center, fitness center and two Bonita Bay clubhouses. The beautifully appointed and amenity-rich clubhouses are a big part of what makes living here so special. With the five Bonita Bay golf courses, world-class tennis, swimming and fitness facilities, residents can easily socialize with friends and neighbors in luxurious style. Bonita Bay Golf Club features five championship golf courses (3 on-site and 2 off-site) - The Marsh at Bonita Bay, Creekside at Bonita Bay and Bay Island at Bonita Bay courses are masterpieces of design by Arthur Hills. The Tom Fazio courses, which include the Cypress at Bonita Bay and Sabal at Bonita Bay courses (off-site courses on Immokalee Road in Naples), challenge and accommodate resident-member Bonita Bay golfers of every level. Lightning detection devices are positioned throughout Bonita Bay and golf courses and GPS satellite communication systems are installed on golf carts at all five Bonita Bay golf courses. Bonita Bay - The Marsh Course: Weaving it's way through the wetland terrain of Southwest Florida, this classic Arthur Hills course plays from 4,923 to 6,636 yards on five sets of tees. Each manicured fairway challenges you to place your tee shots carefully, lest you risk quickly losing sight of par. Bonita Bay - The Creekside Course: The broad, sweeping fairways and limited number of carries present on this Arthur Hills masterpiece is the challenge its 5,756 to 6,742 yards represents. The second shot is key here, you are asked to negotiate the many hills and moguls leading to the course's challenging greens. Bonita Bay - The Bay Island Course: Ranked among the best courses in Florida by Golf Digest. This competitive 6,107 to 7,045-yard course by Arthur Hills draws from the natural lay of the land to create a combination of challenges. Water hazards, sand traps and thick stands of oak and cypress await any errant shot. Bonita Bay - The Cypress Course: An impressive 5,999 to 7,077 yard course, this Tom Fazio designed par 72 Audubon International Signature Course is the longest championship course. Each of the nines is a different challenge, the front nine's spacious fairways and natural bunkering give way to the forested back nine's layout. The Cypress Course is offsite on Immokalee Road in Naples. Bonita Bay - The Sabal Course: Designated a Signature Course by Audubon International, the Sabal Course is a perfect marriage of difficulty and diverson. Tom Fazio's 6,029 to 7,038 yard design will delight novice golfers, while more seasoned players are challenged to swing for the pin, and sub-par scores, on nearly every hole. The Sabal Course is offsite on Immokalee Road. The Bonita Bay Club has a large staff of PGA professionals who are available for instruction. Bonita Bay members may participate in clinics, short game schools, full and half day lessons and video teaching. The Bonita Bay lifestyle reflects the dual nature of the game of life. The fitness center is a commitment to enhancing physical well-being through workouts, massage and esthetician services. The swimming complex will accommodate the most aquatically-inclined. For those who prefer the great outdoors, a butterfly garden, playgrounds, tennis, fitness and biking trails, picnic facilities, canoeing and kayaking are all there for your enjoyment. The Bonita Bay Tennis Center has one of the busiest social and competitive calendars in the country with more than 25 league teams and exciting events and weekly play. 18 Har-Tru courts have a subsurface irrigation system that maintains top playing conditions at all times; 13 of the courts are lighted. There are two USPTA Master Professionals in the teaching center where staff analyzes videotaped play and uses computer software to develop playing strategies. The newly remodeled Bonita Bay West clubhouse is classically designed with opulent details to give it a timeless feel. Enjoy both casual and five-star dining, a lounge and the area's premier pro-shop. The 55,000 square foot facility also includes meeting and banquet rooms available for private events. The Bonita Bay East Clubhouse, located at the off-site home of Cypress at Bonita Bay and Sabal at Bonita Bay golf courses, is a 8,294 square foot, lodge-style clubhouse nestled amid cypress stands, Florida slash pines and sabal palms. The Bonita Bay Clubhouse features a formal dining room, a mixed grille room, a full-service bar. pro-shop and locker areas. Bonita Bay also has an off-site private Bonita Bay Beach Club. The club is located about a mile past Doc's restaurant on Bonita Beach Road and residents can take a shuttle to the Beach Club (or drive). Bonita Bay home owners can also access the public Bonita Bay Marina Club, which offers waterfront dining, social and educational activities in nautical-style buildings at the marina, wet and dry boat slips, and direct access to the Gulf of Mexico. The Bonita Bay Marina is fully equipped with a bait shop, fuel pumps, and a ships store, but is now public (was previously a private marina for residents only). Sightseeing and fishing charters can be scheduled on the premises. And when you return from your excursion, you can enjoy lunch, dinner or drinks dockside at Backwater Jacks at Bonita Bay, the private resident-member restaurant. Bonita Bay was honored by the Urban Land Institute as the nation’s number one large-scale residential community, evokes a unique charm – a sense of enchanting departure and welcome arrival. Bonita Bay a place unlike any other and the standard bearer for the Florida community lifestyle. Xeriscape landscaping enhances nature and supports indigenous wildlife and it was also named Environmental Leader in Golf by Golf Digest magazine and the Sierra Club and Audubon International have awarded it special recognition for environmental stewardship. Currently there are two new Bonita Bay high rise condos for sale available in Bonita Bay - Seaglass at Bonita Bay and Omega at Bonita Bay. The other Bonita Bay high rise condos for sale (resales) are at Esperia at Bonita Bay and Tavira at Bonita Bay. Looking for a Bonita Bay real estate agent? Want to search like a Bonita Bay real estage agent? Join our Free Bonita Bay Florida Real Estate For Sale Email email service to be notified of Bonita Bay Open Houses or when Brand New Bonita Bay Club homes for sale or Bonita Bay condos for sale hit the Bonita Bay real estate market! Step in to this beautiful turnkey furnished, move-in ready villa with golf course view. This home has many lovely features such as, marble and hardwood flooring, plantation shutters, volume ceiling, french doors, granite/tile counter tops, electric hurricane shutters. Pocket sliding doors allows you to invite the outdoors right in to your home. Take in the sunshine in your resort style pool with waterfall, spacious screened-in pool cage offers a great area for entertaining. Gather around the fire pit on a chilly evening with family and friends,or sit under the heating lamps for extra comfort. This spacious open floor plan villa flows from the kitchen, breakfast nook and living/dining areas. A wonderful place to host your guests. Split floor plan concept offers your guests their very own private guest room and full bath. There are many fun outdoor activities to enjoy at Bonita Bay, kayaking, canoeing, boating, bike/jog paths, tennis or jump on the shuttle for a short trip to the white sandy beaches. Golf and Social memberships available! 26974 Montego Pointe Ct 102, Bonita Springs, FL new listing! 26880 Wedgewood Dr 501, Bonita Springs, FL new listing!